Andrew Haringer has won three games, all from behind. What will happen in his fourth? He’s gonna need to do it again. Remember that yesterday, Andrew played it safe and won by a dollar. If Andrew doubles his score, he’ll have 26,400. 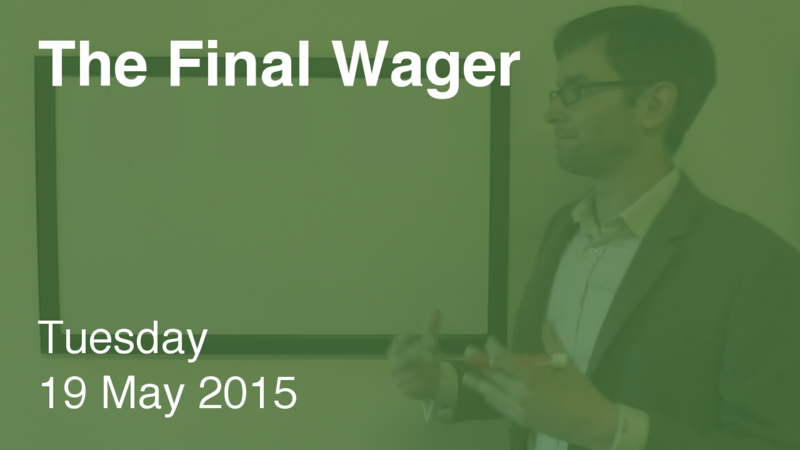 To cover this all-in wager, Todd will need to wager 12,800. An incorrect response with that wager will leave Todd with 800. To stay above his total, Andrew can wager up to 12,400. Liz can wager up to 6,600. A successful doubling will put Liz at 14,800. To cover this, Andrew should wager at least 1,600. Todd would need to wager at least 1,200. Liz would need to wager at least 5,000 to get above Todd if he makes that play. Mind games don’t make a ton of sense here. Todd and Andrew are too close in score for Todd to go for less than the lockout wager; there’s also no downside to Andrew covering a double-up by Liz rather than, say, wager 800 to cover her maximum against Todd. Why? That’s such a completely reckless wager, when holding back even $800 would be far better. How? He’s picked his spots perfectly: all-in both times he got Final right, and conservatively both times he got Final wrong. Andrew seems to be one of those players who wager based on category rather than game theory, even though he can wager pretty well from second when he wants to (game 3). Since Liz can both get into range if Andrew wagers the minimum to cover her while at the same time remaining above Todd’s MSBIW that’s probably her best range (and since she can additionally cover both opponents’ zero wagers that narrows it further). If the two ranges were mutually exclusive then her choice would have more justification, but since she doesn’t have to choose her wager gets the “bad but not terrible” grade IMO.